Study of bacterial gene expression heavily relies on E. coli-based in vivo and in vitro systems with RNA polymerase at their core. Although methods utilizing RNA polymerase assembled from individually expressed subunits or single-subunit expression vectors have met with considerable success, our experience indicates that co-overexpression vectors, featuring most or all RNA polymerase subunits have substantial advantages, particularly in efficiency of assembly of some mutants, deemed “defective” based on in vitro assembly attempts (see for example Artsimovitch et al, Co-overexpression of Escherichia coli RNA polymerase subunits allows isolation and analysis of mutant enzymes lacking lineage-specific sequence insertions, JBC, 2003, 278(14):12344-55). Here we present the latest co-overexpression vector for E. coli RNA polymerase, pVS10, and a sample protocol for purification of the enzyme produced using this vector (although it should be compatible with any classical RNA polymerase purification protocols as well). pVS10 vector contains ORFs for 4 subunits, comprising E. coli core RNA polymerase rpoA (a), rpoB (b), rpoC (b’), and rpoZ (w). This plasmid has been successfully used as a platform for genetic manipulations of rpo genes and production of the wild-type as well as a number of mutant enzymes. It has been tested for expression in BL21(DE3), XJb(DE3), and DH5a(DE3) cell lines using both IPTG– and autoinduction (e.g. Overnight Express, Novagen) protocols. Yield varies with the toxicity of the construction, the identity of the strain and the induction conditions, usually within 1-10 mg/L of culture. The autoinduction using the Overnight Express (Novagen) reagents was carried out according to the manufacturer’s protocol with modifications to preculture preparation. BL21(DE3) cells transformed with pVS10 plasmid were inoculated from the frozen stock into 30 ml of LB medium (Miller) supplemented with ampicillin at 100 mg/L in 125 ml flask and grown with agitation at 37C till OD600 =0.6, when 0.6 ml of this culture were used to inoculate 600 ml of LB medium (Miller) supplemented with carbenicillin at 100 mg/L in 2 L flask, supplemented with Overnight Express reagents per Novagen protocol. The culture was incubated at 32C with agitation for 18 hours, and cells were harvested by centrifugation (4C, 5000 g, 10 min). Cell pellet was frozen (-80C) and thawed (on ice), cells were resuspended in 50 ml of lysis buffer (500 mM NaCl, 50 mM Tris-HCl (pH 6.9), 5% glycerol, 0.2 mM b-ME) supplemented with 1X Complete EDTA-free protease inhibitors cocktail (Roche), and 1 mg/ml lysozyme. Suspension was incubated on ice for 60 min with occasional swirling, supplemented with Tween 20 to 0.2% and sonicated briefly to disrupt the cells. Extract was cleared from cell debris by centrifugation (27 000 g, 15 min, 4C). Cleared extract was combined with 4 ml of 50 % Ni-NTA slurry in lysis buffer and incubated with agitation for 30 min at 4C. The slurry was poured into a disposable gravity flow column (Bio-Rad) and drained. The column was washed with 20 volumes (40 ml) of lysis buffer, and 10 volumes of heparin column loading buffer (50 mM Tris-HCl, pH 6.9, 5 % glycerol, 0.5 mM EDTA, 1 mM b-ME) supplemented with 10 mM imidazole. Elution was carried out by adding 1 ml aliquotes of heparin column loading buffer, supplemented with 250 mM imidazole. Fractions with more than 0.2 mg/ml of protein (by Bradford) were analyzed using SDS-PAGE, the ones containing RNAP were pooled and if needed concentrated to total volume of 4-5 ml using Amicon Ultra 100K concentrators (Millipore). RNAP-containing pool of fractions was loaded onto a 5 ml Heparin HiTrap column (Amersham) at 0.5 ml/min using low-pressure LC system (AKTAPrime, GE) (can use Heparin 16/10 columns for larger scale preps, load at 1 ml/min). Column loaded with polymerase preparation was washed with 5 column volumes (25 ml) of loading buffer, elution was carried out using linear gradient of NaCl in loading buffer : 0-1.5 M NaCl over 120 ml at 1 ml/min. Peak fractions were collected, pooled, and dialyzed against loading buffer (alternatively the ionic strength can be reduced by several cycles of concentration-dilution with loading buffer using Amicon Ultra 100K concentrators). 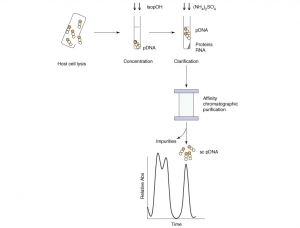 Polymerase fractions collected in previous step were loaded onto 6ml ResourceQ column (GE) using the same system at 0.5 ml/min, washing and elution were carried out as described for Heparin Hi-Trap column. Peak fractions were analyzed by SDS-PAGE, pooled, and dialyzed against the DNA-agarose loading buffer (10 mM Tris-HCl (pH 7.9), 0.1 mM Na-EDTA, 0.2 mM b-ME, 5% glycerol). Polymerase fractions collected in previous step were loaded onto 5 ml DNA-Agarose HiTrap column (GE) using AKTAPrime LC system at 0.2 ml/min. Loaded column was washed with 4 volumes (20 ml) of DNA-agarose loading buffer, and purified core RNAP was eluted using linear gradient of NaCl in loading buffer 0-1.5 M over 100 ml at 0.2 ml/min. Core RNAP containing fractions were analyzed by SDS-PAGE, pooled and dialyzed against RNAP storage buffer. NEXT POST Next post: Biochemistry, Molecular Biology, Molecular Ecology, Archaea.